At least one person has been killed and 17 others injured in a gun battle between Palestinian police and Hamas militants in Gaza City. Witnesses and paramedics said the trouble began after the police ordered a car with two men to stop. The men opened fire and threw grenades at the security agents, triggering the shooting exchange, the witnesses said. The Palestinian authorities condemned what they called a senseless attack by the militants. Both the authorities and militant groups appear to be trying to exert their influence in the run up to the expected Israeli withdrawal from the territory, the BBC's David Chazan in Gaza says. The militants see the pullout plan as a victory for the Palestinian uprising, or intifada, but the Israelis are determined to take tough action against the militants before they leave, our correspondent adds. The incident came only hours after Israeli air strikes on the territory in which four Palestinians were killed and several others injured. The clashes broke out near the Palestinian military intelligence service's headquarters in Gaza City after the car with the militants had been requested to stop for an identity check, Palestinian officials said. "The passengers threw three grenades at the patrol, killing one bystander," a Palestinian official told the AFP news agency. 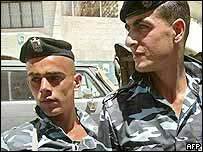 During the exchange of fire, 17 people were injured, most of them Palestinian policemen, sources at a local hospital said. Many of those injured were reportedly members of security forces under the leadership of Palestinian leader Yasser Arafat's cousin, Moussa Arafat. The Palestinian official said the preliminary findings showed the gunmen were members of the Ezzedin al-Qassam Brigades, the military wing of Hamas. The police sealed off the area as they conducted a search for the militants. "The incident took place in Gaza City... between Palestinian police and militants"